With every entry of Our Favorite Characters, we look back at (virtual) people who mattered to us. Which characters did we like the most? What made them so precious to us? Why should other people love them? Well, this time we’re talking about a duo. Partially, because it would be cruel to separate them. But also, because it is my turn to take a shot at this column and that means we are playing by my rules now. (Besides, someone else already did this, so blame him for starting this terrible trend.) 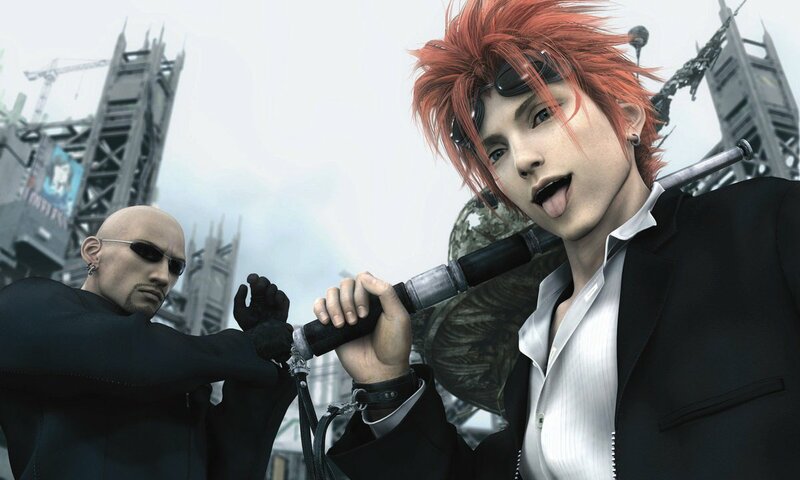 So this time, we’re saluting our favorite Final Fantasy VII characters: Reno and Rude. The Turks, in general, are supposed to be a group of bad guys. 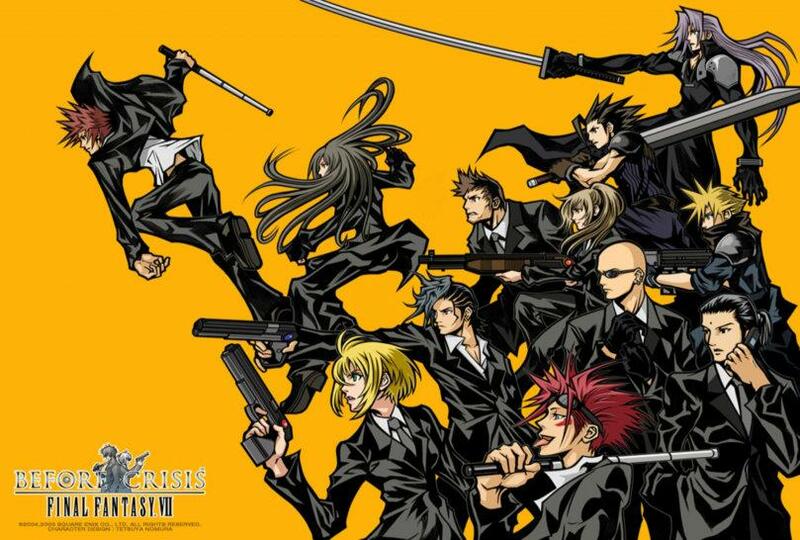 They work for Shinra after all, as the Investigation Sector of the General Affairs Department. But while they’re bad guys, they’re not exactly bad guys. While they partake in some particularly unconscionable acts, like dropping the plate on Sector 7 to defeat the “terrorist” group Avalanche, they sometimes feel more like a group of bumbling rivals or inconsequential roadblocks. The first Turk we meet is Reno. After Cloud falls into Aerith’s life, we come across Reno and some Shinra soldiers who are assigned to watch over Aerith. Reno doesn’t immediately go after Cloud, saying he hasn’t decided how to handle the situation yet. Once Cloud and Aerith run and Reno realizes Cloud was a member of Soldier, he gives chase. However, he also directs his minions not to trample Aerith’s flowers, even though he accidentally already did that. This first meeting says a lot about Reno and the Turks in general. The group is watching over Aerith, but doesn’t make its presence known until an unknown person who could be a threat appears. Reno doesn’t give the order to pursue until he sees Cloud has Mako eyes. He shows consideration for the flowers Aerith is tending, though there’s a hint as to how he might think before he acts since he accidentally walked over them before telling his men not to trample them. Our first meeting with Rude is more professional. 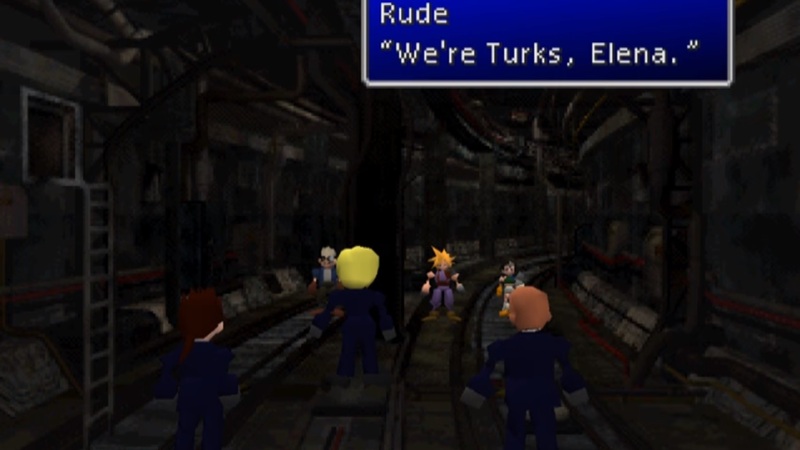 When Cloud and the crew are heading to the Shinra building to rescue Aerith (and Red XIII), you will end up in an elevator with Rude and Tseng. They will capture the group and send them to prison, which is ironically exactly where you would want to be. It’s a stoic introduction to the more professional member of this duo. Before Crisis: Final Fantasy VII is the mobile-only Final Fantasy VII spin-off that should have been released worldwide, but never was, and it is a goddamn shame we will never get to play it. In this spin-off, the Turks were the stars. This is before they were officially loyal to Rufus Shinra. It takes place back before it was just Reno, Rude, Tseng, and Elena. Hell, Elena is only a teenager when it happens! It is her older sister, a woman who is now only known to the ages as Gun (Female) because this game was never localized or released on other platforms, was a member of the team. Reno and Rude were senior members who helped train the new, original characters. We see them as mentors who are mostly capable. Though, to get a better idea of what they were like at this point in time, it is better to turn to Zack’s story. It’s in later entries that we get to see Reno and Rude stand out. In Crisis Core: Final Fantasy VII, sometimes they’re working alongside Soldier Zack Fair. His first meeting with them shows off their unique dispositions. Reno is conversational. He’s casual when talking about Midgar’s problems and how the Turks are going in to clean up after Soldier, while Rude puts it more tactfully. Reno can’t wait for Tseng’s orders to move out, while Rude chimes in with a respectful, “Yes, sir” after being dispatched. With Final Fantasy VII: Advent Children, we get to see Reno and Rude (attempt to be) big time heroes. They get about as much screen time as characters like Cloud and Tifa. We see them do all they can to get the remains of Jenova out of the hands of Kadaj, Loz, and Yazoo. They complete this mission even though it means leaving Tseng and Elena behind. While there’s some good-natured sparring between Reno and Cloud when they first meet again, there isn’t the same determination behind it, as in past games. We watch as the two go against Loz and Yazoo multiple times, even though they are absolutely outmatched by the Remnants. They try to save the children from getting caught up in Kadaj’s attacks on Midgar. They continually act as agents of good. Reno and Rude are just plain cool. 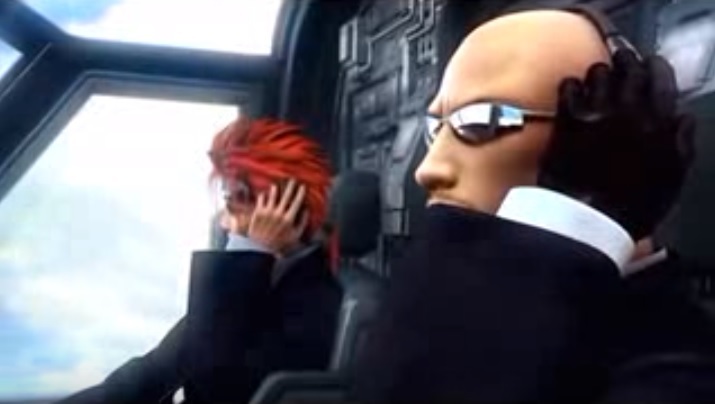 They’re people who are clearly good at their jobs, since they managed to rise up through the ranks of Shinra. However, they’re also very human. This means Reno can be excitable, Rude and be awkward, and both of them can sometimes act as comic foils. They have a great dynamic going, which is why they are such a highlight in Final Fantasy VII‘s canon.